Skinny water Murray cod fly fishing! If you believe what you read, fly fishing requires the touch of a surgeon and the spirit of a I don’t what!! Forget what you’ve heard, read or even been told about fly fishing in the past. If you really want to learn how to fly fish all you need are the right tools, technique, and a positive attitude. With these essential elements, you can begin to enjoy the sport of fly fishing in no time. Some fly fishing is done by means of “sight fishing” NO not the fish the sight the structure, beneath the water surface. I can say on a couple of occasions, I have sight the dorsal fin of a green back. Don’t rely on sighting Murray cod; study the structure with accurate cast to count! Good polarized sunglasses will minimize the glare off the water assisting you to spot the structure. Looking out for any sort of aquatic life that might be in the area where you want to fish. This will able you to choose your flies accordingly since the fish might be feeding on the same food. 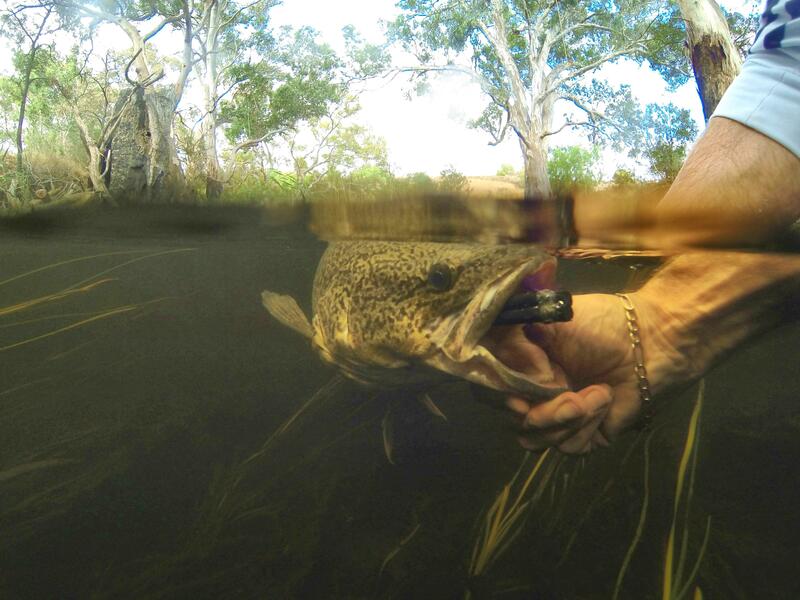 Murray cod the fish I cut my teeth on fly fishing – fish I had to get clients to catch -are very smart and wary. I had to develop techniques and flies that would consistently produce. Though I’ve tied and fished array of the patterns, I take most of my fish on flies tied in a large profile. Flash and neutral colors and bright flashy flies will produce in the right conditions. The action of the fly is paramount too, often over looked all flies have a purpose. Fly profile and the way the fly is built on the hook you take in to consideration. Min able spin though the air and drag, weight and length not just as easy as you might think!